10 WWW.BKT-TIRES.COM G R O W I N G TO G E T H E R Andy Ondo, North Gateway Tire, has been working with BKT for over 20 years. "BKT offers quality and advanced technology with a pattern and size lineup that is unmatched in the field for all equipment. BKT tires are competitively priced for the market for their quality. We always recommend BKT first as our premium, quality tire that you can purchase with confidence for your farm or construction needs." 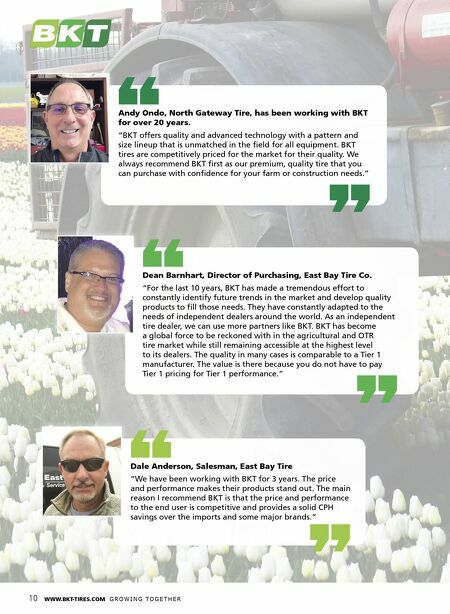 Dean Barnhart, Director of Purchasing, East Bay Tire Co. "For the last 10 years, BKT has made a tremendous effort to constantly identify future trends in the market and develop quality products to fill those needs. They have constantly adapted to the needs of independent dealers around the world. As an independent tire dealer, we can use more partners like BKT. 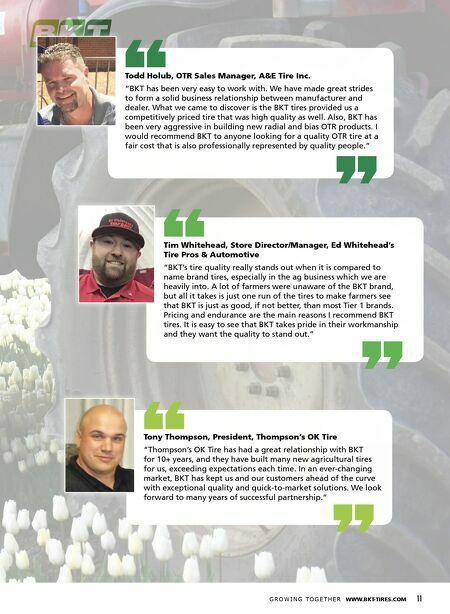 BKT has become a global force to be reckoned with in the agricultural and OTR tire market while still remaining accessible at the highest level to its dealers. The quality in many cases is comparable to a Tier 1 manufacturer. The value is there because you do not have to pay Tier 1 pricing for Tier 1 performance." Dale Anderson, Salesman, East Bay Tire "We have been working with BKT for 3 years. The price and performance makes their products stand out. The main reason I recommend BKT is that the price and performance to the end user is competitive and provides a solid CPH savings over the imports and some major brands."